Car wash signs are an important part of running a car wash. 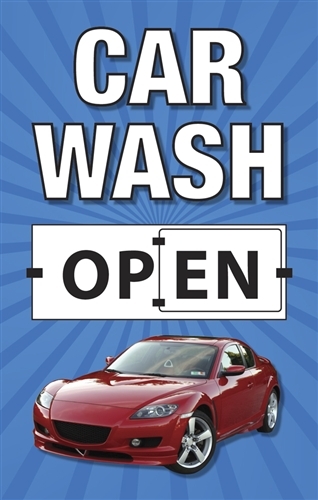 They help let drive by traffic know you're open for business, the prices of your car washes and they help draw attention to your car wash. If you're opening a car wash or currently have a car wash, there are certain signs you need to make sure your business has to communicate vital information to customers and traffic. Before making a purchase or deciding to go somewhere, one of the first questions that comes to mind is "how much is it?". If a customer cannot easily find that information, they may keep driving and take their business elsewhere. If large LED signs are out of your price range and your prices change frequently to invest in a one price sign, then car wash flip signs are the perfect fit for your business! 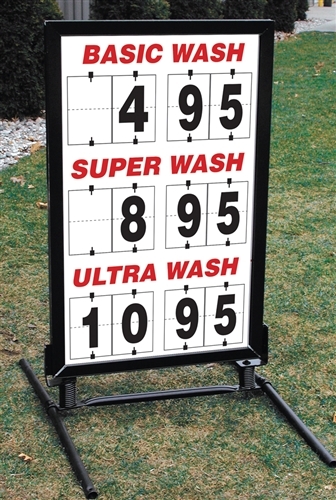 A Car Wash Flip Price Sign is a cost-effective and convenient way to display your latest, most up-to-date prices. These signs can be customized to three different wash choices and can display prices from $0.00 - $99.99. The price is changed by unclasping the aluminum clip, flipping to the appropriate price, and clasping it to secure the price. It is very important to have signs letting customers know when you're open and when you're closed, especially in inclement weather. If there aren't currently any cars going through your wash and there isn't a sign saying "OPEN", customers may assume you're closed and drive to the next closest car wash.
A simple Open / Closed Flip Price Panel Sign is a great option to have a sign you can customize with your art, colors and logo while still being able to flip it from open to closed to inform your customers. It is also a good idea to have some "closed due to weather" signs incase of a storm and you have to close without notice. They are also good to have up in winter months to let customers know not to look for you until spring. 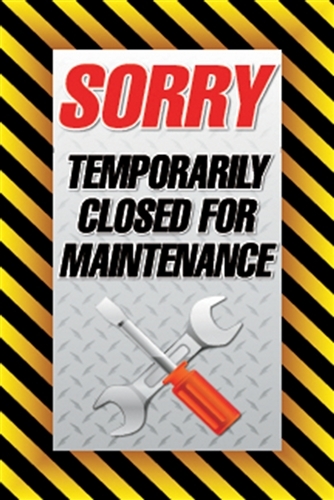 Closed for maintenance signs come in handy during repairs that cause the car wash to temporarily shut down. These signs let customers know the car wash will be back open shortly and they can wait or come back later. You only wash car. Do you have car functionalities. Can we buy fm audio transmitter? These car wash signs was good. It is important while we open a car wash company. If we make this sign by Digital Sign then this will be more better if we see. I agree that car wash very important for business. All these tips and rules I’ll remember. self import car to Singapore is great company they released new car models. They provide you your dream car. I really enjoyed reading this article, and found it quite informative. And especially the part about wrapping the vehicle. Thanks for sharing! I generally prefer RTS for truck wraps kent and would recommend it to all.